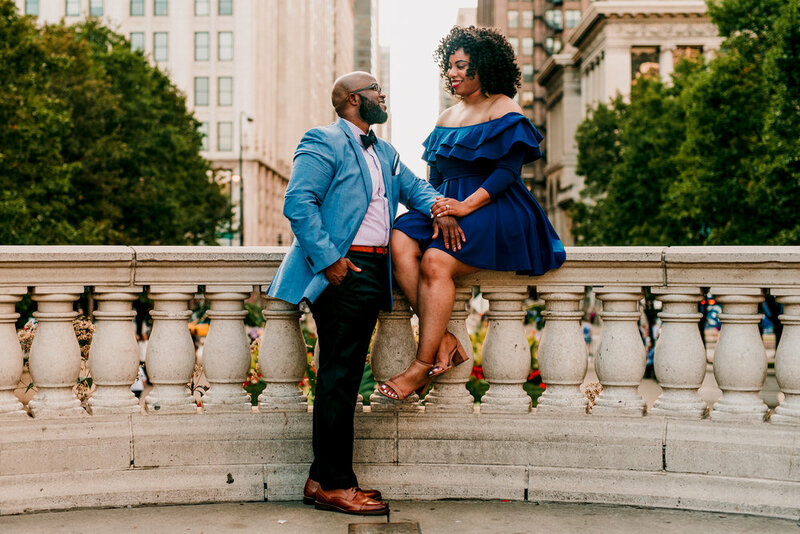 Shadae and Tay decided to have their engagement photos in front of the Chicago Theater on a warm, sunny afternoon. 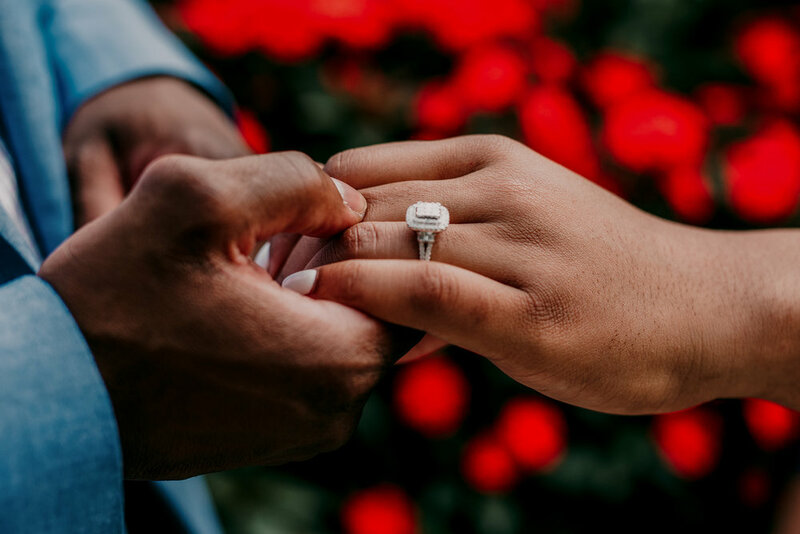 If the photos captured by Emily-Melissa Photography LLC aren’t the sweetest then their proposal story definitely is! 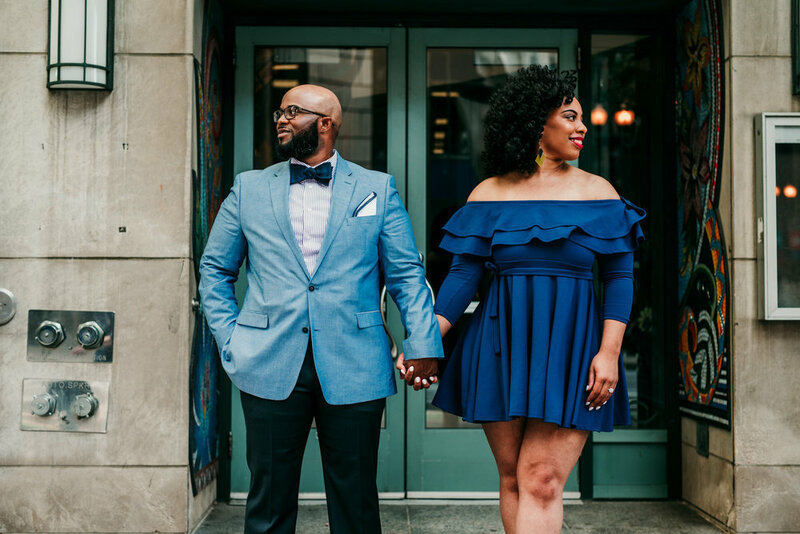 “In the summer of 2017, my parents were visiting the Chicago area on business & unknowingly he had contacted them and he met for lunch with the sole purpose of asking their blessings for my hand in marriage. Once I found out that transpired (after the proposal), I was impressed. I thought that might’ve been an lost art! He knew how important my circle was to me so he also had let my closest friends in on the secret, so most of my family & my best friends had known and held this secret in for five+ whole months!! I still can’t believe that all got past me without me having a clue! I was set to graduate December 17, 2017. He flew down to Houston so that we could celebrate an early Christmas together and of course to attend my graduation. My family and my close friends had all come in town as well. Graduation day came & I am of course in hurry & making sure I stay on schedule so that I can be where I’m supposed to be on time. He on the other hand was not moving fast enough for me. He was listening to music, singing & dancing, washing dishes, sweeping the floor, straightening up as I messed up, etc. I was like, “Hurry babe & get dressed. We’ll do this later — I’m gonna be late!” We finally made it out the door, but not before I fussed at him AGAIN for lagging behind. “Go ahead and get in the car babe! I’m coming & you’re not going to be late!”, he said. Later I found out that he was trying to get my ring and the other items he needed for the proposal. (I apologized to him. Lol.) So graduation came and I walked across that stage to receive what was due to me...I could exhale. A major milestone in my life was completed. I was proud of myself and thankful to God for getting me through. I was emotional and hugging some of my classmates who knew my struggle along the way when my best friends Bryanna and Jessica came to find me because apparently I was taking too long to come out to my family. Lol. I was wondering where everyone else was and they told me everybody was in the lobby waiting on me. Ok, cool. As I walked through the door, I see all of my family and friends so I walk towards them. I hugged my mom & bent down to hug my niece who was jumping up & down in excitement when she saw me. As I was hugging her I heard music start to play. The intro was familiar, I had heard it playing in the background on the phone with him before. It was the artist Kem’s song “It’s You”.